SO how’s it been with the kids for the last fortnight then? Come on, it would have been much worse if the weather hadn’t been so good. It’s been April, for goodness sake. We managed to get some days off work and tick a few ‘done’ boxes while school was out, including general slobbing and a theme park. 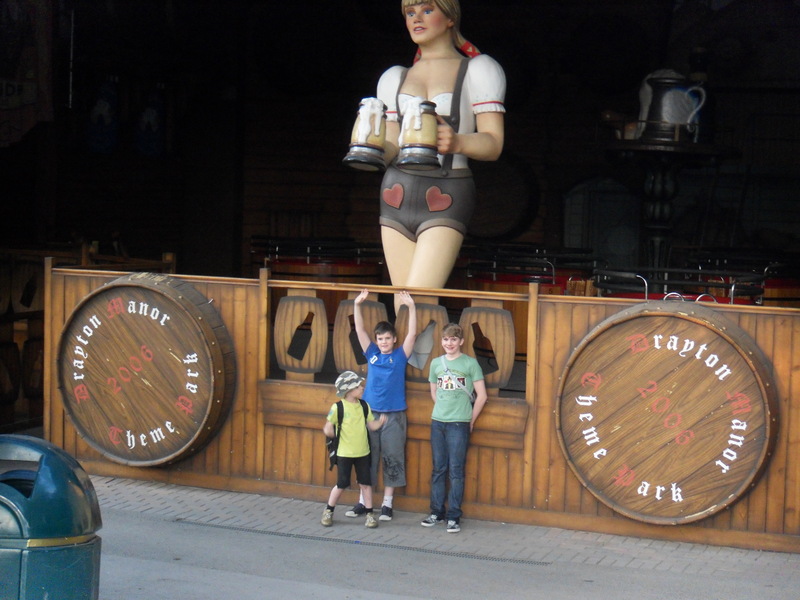 Theme parks can be pretty unbearable and expensive places, and the prepared parent will need to do their homework to avoid any tears, especially their own. Look for vouchers, two-for-ones and pack your own drinks for starters. We returned, after an absence of several years, to Drayton Manor Theme Park, up the A5 in Staffordshire. It should have taken about an hour to get there, but the weather and hideous traffic jams extended the sweaty car experience to two hours. 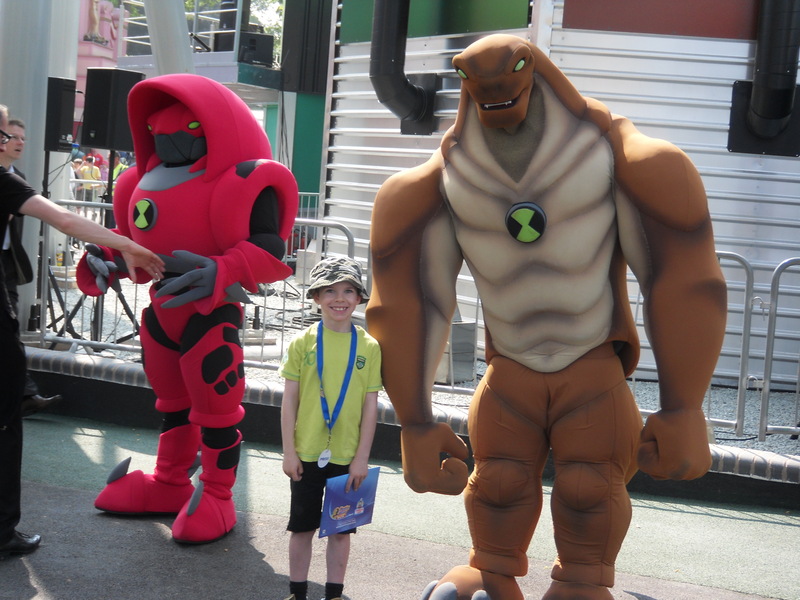 We were there for the opening of Ben 10 – Ultimate Mission, a ‘junior’ roller-coaster for anyone over one metre tall. Ben 10, for the uninitiated, is a TV cartoon character kid, who finds a weird watch called the Omnitrix, which turns him into ten different alien superheroes. None of our boys are particularly ‘into’ Ben 10, but Billy, being seven and a boy, hits the target demographic perfectly. Jed and Dougie aren’t sure whether they like scary rides or, like their Dad, they feel no desire whatsoever to go on them, ever. The ride, for coaster-nerds, is a ‘boomerang’ style, with a spiral thingy in the middle. You get dragged slowly up one side, backwards, then fired at speed through the twisty bit and up the other side. Then you do the same thing, only backwards. You never turn upside down. Unlike the queue, the ride lasted a grand total of 45 seconds. Billy was quite pleased with it as it was fast enough to be scary. The elder two said it could have been longer, but thought it was a good first step between a kiddie-coaster and the bigger, more height-restricted rides. (Beware the parent-trap of the strategically-placed Ben 10 shop next door). To pacify the disgruntled Bonnie, who wasn’t impressed to be told she was too small for some rides, we headed next to Thomas-land, a section of the park devoted to Thomas the Tank Engine. This is truly a hideous experience, where you will find hundreds of literally pushy parents, ramming each other with buggies and forgetting all manners. The queues were very long, confusing and overlapping, and we waited an hour and half in the sweltering heat for a roller-coaster Bonnie was just tall enough to go on with me, called Troublesome Trucks. It was pretty fast and high enough to scare her on the first circuit, but by the second she was shouting “go again, again!” and refusing to get off. As well as several rides and play areas, there’s also a new Thomas exhibition set away from the main area where they have sets from the TV series. Thankfully the boys are well past their Thomas phase and Bonnie could be bribed away with promises of ice-cream and zoo animals. I always find it a little odd to find a zoo in the middle of a theme park, but it stems back to the 1950s when most parks like these consisted of just a few fairground rides and an animal enclosure. This zoo has plenty of monkeys and penguins, snakes and birds, but Bonnie demanded a tiger and luckily she saw two. The sun was scorching by now, and we had another hour and a half wait in the heat for the rubber dingy rapids, or Splash Canyon, which we were all able to go on together, but wasn’t really very splashy at all. However, after another hour’s wait for the much more scary-looking Stormforce 10 water ride, I thoroughly embarrassed my two eldest sons by producing – and wearing – a waterproof cape. I’d seen just how wet and shivering others had been getting off and wasn’t going to let the matter of looking a prat get in the way of my comfort. Needless to say, the boys, in jeans, got COMPLETELY drenched, like they’d been dunked in a bath, while I was smug and dry. Theme park food can be a complete rip-off, but there were pizza/pasta, burger/chicken and a very good pie and mash shop, with meals about £5 per head. The loos are rather aged, and parts of the park are clearly due for a makeover, but they are planning more changes. One major complaint for Drayton Manor: no wait-time indicators. Most attractions now have these at various points in the queue which helps enormously when you have children who suddenly announce they need the loo. Other than that we all had a really enjoyable, surprisingly row-free day. And by hanging around until after 5pm, there were no queues at all when Dougie bravely offered to come on the massive Shockwave stand-up roller-coaster with me. Whooo!